Whether you are an M&E expert or a data manager at an NGO or government agency, running field surveys can be daunting. One way you can make your work easier is by deploying mobile data collection technology. Let’s look at a few reasons why you should strongly consider making the switch. Collecting data using paper forms can lead to multiple errors. For example, enumerators might leave mandatory questions unanswered or enter invalid responses such as text in numeric fields or values that are out of the acceptable range. Mobile data collection applications help you set strict rules to ensure that only correct data makes it into your research database. In general, using mobile technology for data collection enables enumerators to administer questionnaires faster than using pen and paper. Mobile data collection applications provide helpful, speed-enhancing features such as pre-loaded variables, automatic calculations, in-built branching logic and much more. As a result, enumerators spend less time in the field – leading to time and cost savings for the organization. One of the main disadvantages of pen and paper data collection is simply how long it takes between the collection and the analysis of data. Printing questionnaires, transporting them to and from the field, data entry, data cleaning and data analysis all take a significant amount of time and resources to accomplish. Mobile data collection technology allows you to go from interviewing respondents to visualizing analyzed responses within seconds! Sophisticated charts and summary statistics empower you not only to monitor progress but also to react to emerging issues and expedite report writing at the end of the exercise. 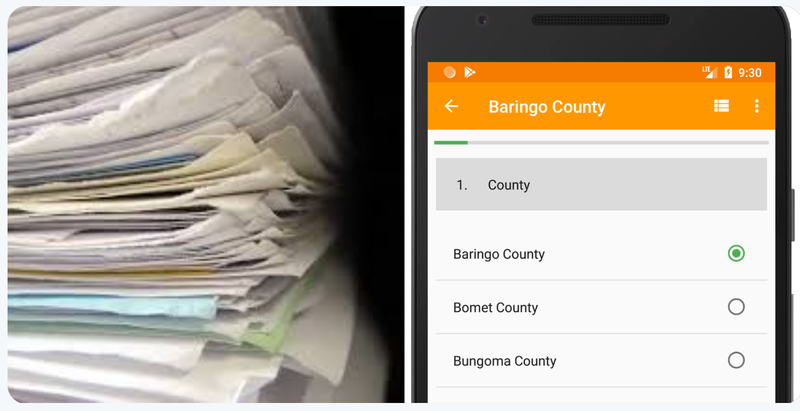 As already mentioned, mobile data collection saves money on printing, data entry, transport and storage. Because it is also faster and more efficient, field officers spend less time in the field, leading to further savings in logistics expenditure. In addition, higher quality data leads to better decisions and ultimately optimal interventions that facilitate prudent and efficient use of resources. What could possibly be better than that? Securing paper-based records is not always easy. Often, they are stored in shared offices or at best, in locked cabinets. There’s no easy way to prevent unauthorized access or, more importantly, detect and react to security breaches when they occur. Digital data, on the other hand, can easily and cheaply be secured using time-tried and widely-adopted security practices such as passwords, encryption and firewalls. For even greater peace of mind, triggers can be configured to notify the administrator of any security breaches before too much damage is incurred. Well, if you are ready to make the move, we at Hoji Ltd provide by far and away the most sophisticated mobile data collection and analysis technology in the market today. From basic features such as data validation and branching logic to complex functionality like data analysis, dashboards, GIS, sampling frames and much more, we have it all under one roof. But don’t just take our word for it. Every day, tens of both local and international organizations use our platform to power their data collection, management and analysis, and here is what they have to say.